Asia International Hotel, Guangzhou rooms number 422, located on 25-38 floor, including 280 deluxe rooms, 40 suites, business rooms 96, apartment-style suites 5, 1 presidential suite, rooms are equipped with broadband Internet access . 35 square meters of exquisite space, Deluxe Twins/Double Room with two single beds(120CM X200CM) or a queen-size bed(150CM X 200CM). Room rate includes single or double occupancy. High-speed internet free(Free wifi in room). Non-smoking available. 36 square meters of exquisite space, Business Twins/Double Room with two single beds(120CM X200CM) or a queen-size bed(150CM X 200CM). Room rate includes single or double occupancy. High-speed internet free(Free wifi in room). Non-smoking available. 47 square meters of exquisite space, Deluxe Suite with a king-size bed(180CM X 200CM). Room rate includes single or double occupancy. High-speed internet free(Free wifi in room). Non-smoking available. * The price does not include 15% taxes and service fees. 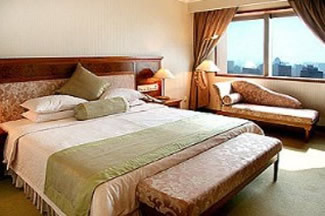 * Extra bed is RMB 218(USD 32)per bed per night. © Copyright ©2002-2013 WWW.GUANGZHOUASIAINTERNATIONALHOTEL.COM. All Rights Reserved.